The Modern College of Business and Science (MCBS) in the Sultanate of Oman is a private College licensed by the Ministry of Higher Education and established in 1996. In 2004, MCBS sought institution and program accreditation to offer Bachelor Degrees in Oman. MCBS was successful in its application and based on the strength of its submission, the College was provisionally accredited by the Accreditation Council of the Sultanate of Oman to offer Associate and Bachelor Degrees. The College offers educational programs to meet the needs of individual students as well as the needs of the business and industrial communities. The College offers degrees in Business Administration (with 5 emphasis areas in Accounting, Marketing, MIS, Management, and Economics & Banking), Information Technology and Computer Science. The College also offers Bachelor degrees in Business Administration (with 5 emphasis areas in Accounting, Marketing, MIS, Management & Organizational Behavior, and Finance), Economics, Information System, Accounting, and Computer Science. The College maintains an active affiliation with the University of Missouri, St. Louis, (UMSL) at both the Associate Degree level and at the Bachelor Degree level. 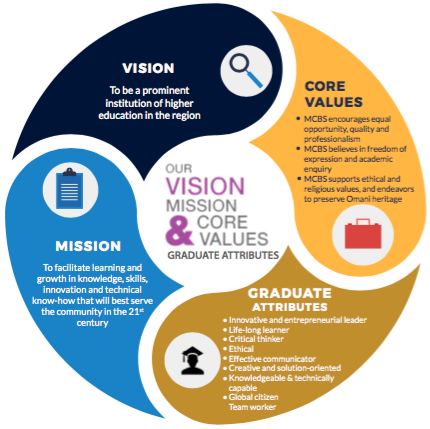 Students presently have the option of completing a two-year educational degree in Oman and seeking employment; completing two years at the College and transferring to another College or University in the United States, Australia, or the United Kingdom, or finishing a Bachelor Degree at the College. MCBS operates a Foundation Program which contains an Intensive English as a Second Language program and offers a certificate in ESL for those students who successfully complete the course. Along with ESL, some Foundation Courses such as Basic Mathematics, Applied Mathematics, and Information Technology are also made compulsory for those students who need to pursue a degree at the College. This is in accordance with the Foundation Program Standards proposed by the Oman Accreditation Council and MCBS is one of the first colleges to have implemented this. The MCBS Quality Audit Report, which was released in December 2009 by the Oman Accreditation Council after the team’s second visit to the College, commended the good practices of MCBS. The report supports our ongoing academic and services improvement efforts. 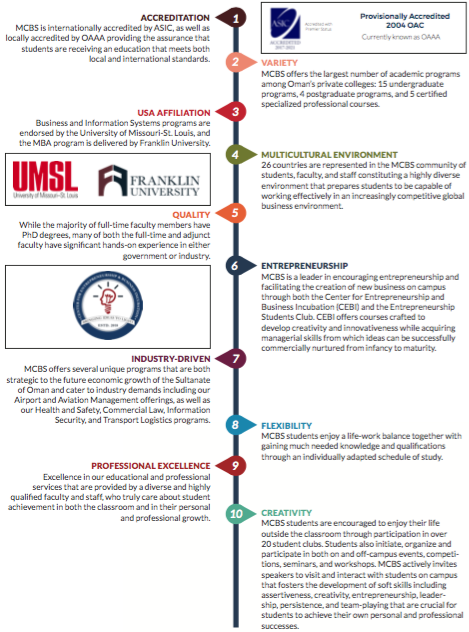 The report also commended the long-standing relationship with UMSL which has enhanced its standards and given an international dimension to the curricula. It was also supportive of the appointment of Fulbright Scholars at MCBS to enhance the curriculum and add expertise to its faculty. Dissemination of information electronically to staff and students have also been commended in the report. The Modern College of Business & Science has been recognized as an outstanding private college in Oman by business today on three separate occasions. Bachelor in Airport Management is offered for students who wish to seek employment in this fast developing logistics sector. The curriculum covers the latest business practices and management techniques that will help graduates manage modern airports. The courses are specially designed to enhance their skills in handling the challenges of a growing air transportation sector and its rising demands. With rapid advances in networked computer technology during the past decade and extraordinary growth of the Internet, the world has become increasingly interconnected and increasingly more complex and vulnerable. Companies, businesses, and governments make all efforts needed to ensure the security and integrity of their systems.